Come enjoy a day of Waterfowl hunting on the Beautiful Texas Gulf Coast. At Wetland Adventures, we offer guided Texas Waterfowl Hunts specializing in The Marshes of East and West Matagorda Bay. Allong with Private Marsh located allong Copano Bay Near Rockport Texas. We also offer guided Hunts over Flooded Rice and Managed Waterfowl Projects in Matagorda, Aransas, Brazoria and Liberty Counties. 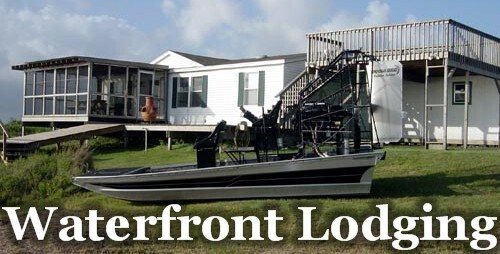 Most are less than an hours drive from downtown Houston Texas. We Shoot a wide Variety of Ducks form Mallards, Gadwall, Pintail, Widgeon, Shoveler and large Numbers of Teal. To an array of divers including Bluebills ,Ringnecks and Matagorda Bays famed massive flocks of RedHeads, Not to mention our one of a kind native Mottled Duck. Our staff has but one goal, that is to make your Texas hunting experiences memorable and enjoyable each and every time you hunt with us. The Texas coastal prairies and marshes are a natural feeding ground for many Waterfowl at the end of their southern migration. Our local area provides the perfect hunting location for sportsmen from across the country. If you have never experienced the thrill of hunting flooded rice fields or the coastal salt marshes, then you owe it to yourself to schedule your trip today. We have Thousands of acers to offer year round Hog Hunts, as well as world class dove hunting within an easy drive of Houston Texas. If you are looking for something we don't offer here , just call and ask, we can usually accommodate just about any request. If not we would be happy to point you in the right direction. You can call me at 979.864.9439 or drop me an EMAIL . You have my personal guarantee that we will work hard to make your hunt enjoyable and productive. We appreciate you visiting Wetland Adventures, serving the Texas Gulf Coast Duck and Goose Hunting community with a service that will make you want to retun season after season. Our morning and afternoon Goose, Crane and Duck Hunting trips offer some distinctly varying opportunities. You can hunt just about any species in the morning while our afternoon trips are primarily in the salt marsh or on the bay, hunting Pintails, Wedgion, Shovelers and an array of Divers. Our Guides spend countless hours in the field and on the water to insure your hunt will be just as productive as the last. And They are all Fully Licensed by the U.S. Coast Guard. 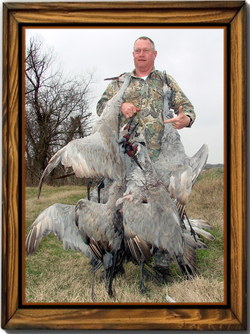 The Upper Texas Coast is home to hundreds of thousands of Ducks, Geese and Cranes From September through February and we are sitting in the heart of the action. let us be your Texas Hunting Guide to the finest of what our coastal prairies and marshes have to offer. We also Have a large population of Feral Hogs as an alternative to our waterfowl Hunting. Allong with Texas Dove Hunting in the early fall. Youth Discount available.Children are not only welcome, but encouraged,they are the future of our sport. Throughout this site you will see many photos of my kids. You may also enjoy mixing your hunts with one of our afternoon Hog Hunts, A cast and blast fishing trip on the legendary Matagorda Bay for Trout and Redfish , or with one of our full offshore fishing packages. Thanks Again From Our Entire Team !